Victoria is the place to be for first home buyers. Due to the above it is no surprise that VIC’s home loan affordability index has decreased even further, by -4.6% over the past 12 months to March 2018; especially when compared to the -0.7% over the past 12 months to December quarter 2017. This puts VIC’s home loan affordability index at 29.3 points, slightly below the Australian average (31.9 points) and slightly above New South Wales (27.4 points). There are several factors assisting those looking to purchase their first property in VIC. Unemployment rate declined by -6.7% over the past 12 months to June 2018, meaning there are more people in jobs and earning an income. VIC takes out the gold award nationally for highest median weekly family income growth, at 2.7% over the past 12 months to March 2018. This suggests an increase in household income, putting families in a better position towards home ownership. 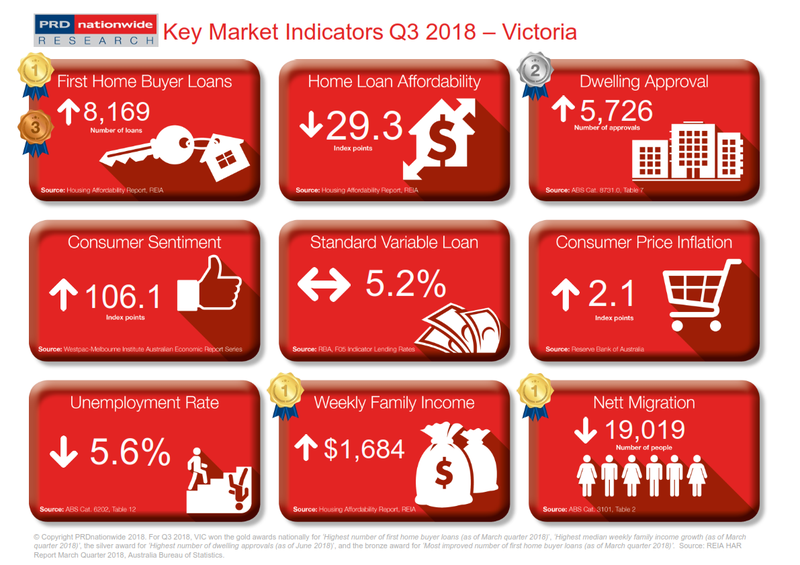 VIC took the gold award nationally for the highest number of first home buyer loans, recording 8,169 approvals over the past 12 months to March quarter 2018. This leads them to taking the bronze award nationally for most improved number of first home buyer loans, growing by 35.3%. Perhaps even more crucial, VIC takes out the gold award nationally for highest nett migration, recording an additional 19,019 people into the state in December 2017. This will assist in absorbing current stock, as well as planned developments, creating a more balanced supply and demand market. This should create a more affordable market in VIC in the medium-long term future.